After our delicious seafood lunch, there is yet another craving that I had to address- my old favorite Japanese fried chicken. This differs from the KFC of my previous post because this one is served simply by itself or with lemon wedges or my favorite combo Kewpie mayo with a little Kikkoman soy sauce stirred into it. I remember having this almost everyday when I was in Japan. It is also one of the dishes along with yakiniku that I tried to recreate when I came back home. Ahh what is it with this delicacy that is so addictive? I remember watching the lady at the restaurant where we frequent then as she prepares it. 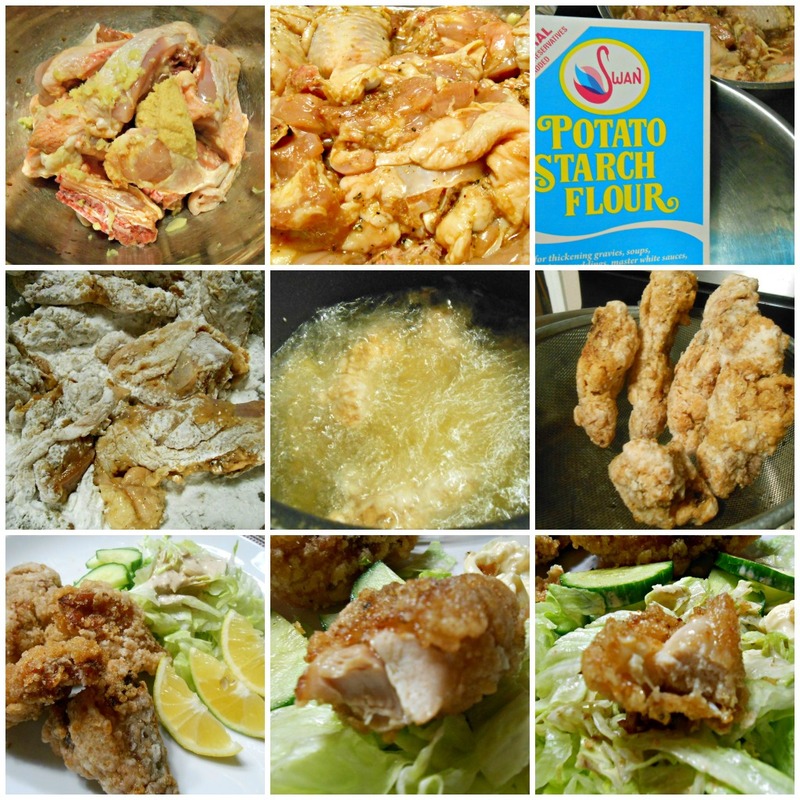 She gets that container with the seasoned chicken strips; dredge them in flour and deep fry them to a golden finish using her large chopsticks for plating with just a side of shredded cabbage with a squirt of Kewpie on top and then some more for dipping. It didn't cross my mind that the chicken strips could be marinated in something but now I know better. Thanks again to the World Wide Web for enlightening me. I came across a recipe which I followed for my new rendition of this old favorite. Fry the chicken in batches until the exterior is a medium brown and the chicken is cooked through. Transfer the fried chicken to the paper towel lined rack. If you want the chicken to stay crispy longer, you can fry the chicken a second time, until it's a darker color after it's cooled off once. Serve with lemon wedges. Notes: I served it with shredded iceberg lettuce and sliced English cucumber with our favorite sesame yogurt dressing; lemon wedges and my fave dipping sauce. I wish I took a better shot of how succulent it is inside while so crunchy-licious outside! This is one of my favorite thing to order when I go out. YUM! Where do you find Potato Starch flour? I can't find it anywhere in American grocery stores. Do you think the Korean grocery stores would have it? You'll find it at Vons :-). I'm sure it's also available at Korean grocery stores in a different brand name if not the same as this one.